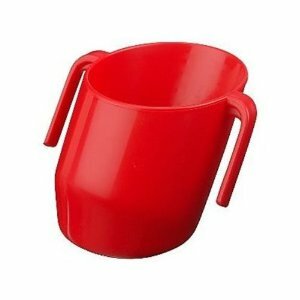 I first started using this cup with my older son when he started drinking from open cups. He found it very easy to drink out of and I gradually weaned him from this cup onto any open cup. The staff at his nursery commented how adept he was at drinking from an open cup from quite a young age. What this basically means for you as a parent is less mess and spillage from a younger age. My only criticism is that he finds the handles a bit tricky to hold as they are quite thin and not easy to grasp for young hands. So now I am going to give it a go with my younger child, using expressed milk or formula. I am expecting mess and avoidance but I am willing to try anything at this stage: next week is my birthday and I really really want to go out for the evening and not have to be worrying the whole time that he will be hungry and screaming! I am also going back to work soon and will not be able to demand feed like I do at the moment, I'm afraid little man that your Mummy feeding days are nearly over! I'll try, I'm willing to try anything! He will only sleep on me too and has slept on me every night since he was born. I am so tired! !